Have you had enough of destructive negative thinking? Do you want to put an end to that nagging, negative inner voice that is diminishing you and always wants to think, fear and expect the worse case scenario all the time? Are you sick and tired of that negative self you seems to be the dominant voice in your head? Silencing that inner negative voice, taking total control of your inner self talk and replacing those bad feelings with calm and positive fillings that will flow through your body. Is one of the most empowering things you can give yourself and it is one the best ways to change the way you feel, boost your happiness, better your performance levels and increase your chances of success. If you are dogged by negative thought patterns and those harmful and destructive emotions. Then, it can feel like your mind is stuck on a constant and unforgiven, negative loop and cycle. Where just like a cassette player or CD that is either stuck or playing on loop, where the same old song gets played over and over again. The same type of thing is what is happening in our inner world. But, when your mind gets stuck in a negative cycle. Not only does it stifle your chances of being more successful. The constant replaying of those same old self destructive negative thoughts generate more negative feelings, stress and unhappiness. Eventually, all the negative self talk. 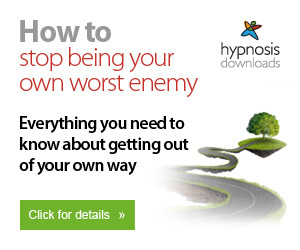 Destroys your self confidence, erodes your self esteem and self worth and makes you feel miserable and self defeated. This traps you in a self imposed mental prison and over a period the constant bombardment of negative thinking and all that emotional baggage you're carrying around with become your normal patterns of thinking and feeling. After a while. Your negative thought process and habits become a part of you as they become deeply ingrained in our psyche and who and what you are. Most people think on autopilot and most of their thoughts are negative. People go to bed with those negative thoughts dominating their thought processes and how they feel. Then as soon as they wake up, because they have not silenced the enemy from within that has infiltrated their mindset. They carry on with virtually the same negative thoughts as they had the previous day, and the day before that and the day before that and so on. Where even though you might intend to change your thinking. It is not before, those old self sabotaging thoughts and destructive emotions, creep back into your conscious awareness. And, before long. The worry, anxiety, doom and gloom and stress starts to gather momentum, and before you know it, those negative stories and negative thought patterns, start to do their damage. Your have lost control, you feel lousy, and your day is yet again ruined. This is like being stuck in a "Groundhog day cycle"
Changing your thoughts and feelings is a process that takes time. What you have to be aware of. Those repetitive negative thoughts are not you. They are thinking you, because of how you are feeling and how you are perceiving your world. We think, with our feelings and emotions. Change your emotions and feelings and your thoughts will change too. But, with a conscious effort and awareness, you can get you mind unstuck from that negative groove and free yourself from your negative mental imprisonment. Change takes time. But you can start to move forwards and make those positive transformations that are going to make you feel better and what is going to improve the quality of your life, in many positive and beneficial ways. It doesn't matter who you are. Life can be hard and cruel at times. We all have our ups and downs and it seems like nearly everybody is struggling to deal with the challenges and adversities of life. In fact life can seem to be so unfair at time. One moment, everything is great and life seems to run smoothly, where everything seems to workout OK.
You receive some bad news, you're not getting the results you would like or life deals you a blow and all of a sudden your mood and mindset changes and your whole world collapses and falls apart in front of your very eyes. Before you know it. You start to feel frustrated, disappointed, pessimistic and those sad and low feeling emotions start to consume your whole body. Now you feel defeated and those negative thoughts and emotions become your most dominant thoughts and feelings. During those difficult periods of your life is when you need to find some inspiration and you need to draw on all your strengths and inner resourcesto help you come through it. This bleak and dark times can leave you feeling stuck, where no matter how hard you seem to try. You just can't seem to get ahead or get anywhere where you just cannot seem to break free from those negative thoughts processes and emotions. No one can feel happy and confident all the time and there will be difficult times when everything seems to go wrong for you. And when we feel negative. It can throw our whole body out of sync and balance. Negative thoughts and feelings are like toxins to your body. This is why it is essential to change both your thoughts and feelings. When you're stuck in a negative mindset and your experiencing negative emotions. When one problem is solved another one always seems to takes it place. There is no doubt that negativity seems to draw towards you more negative circumstances. The first step is to change that negative self talk and begin to change the stories you are telling yourself. Learning to accept yourself, faults included. Will help end some of your negative inner chatter and conflict. When you're stuck in a rut and negative cycle and everything seems to be going wrong for you. Then this is maybe a good time to re-evaluate and reassess your situation and where you would like to be at. Our thoughts and feelings are a good indication on what is going on, on the inside. If you're not getting the results that you want or if things aren't working out great. Then you might need to consider a new strategy and plan. This could mean, a change in thinking, a change in direction or you might need to introduce some new positive habits and healthy lifestyle changes. Although we should all aim to think and be positive. An important life skill to learn, is to know how to bounce back quickly from adversity. Creative problem solving and learning how to overcome life's setbacks, knocks, upsets and challenges will help you to grow and expand. When you can create something good from a negative. Then, you will have learned a valuable skill. When you think about. The only real person that can disempower you and diminish you on a consistent basis, is yourself and your inner self talk and dialogue. Everytime you think a negative thought, you will strengthen, the neural pathways in your brain. Negative thinking will disempower you tremendously, it will cause a restless mind, creating a life and future of doom, hopelessness and pessimism. Negative thinking, is a self destructive way of thinking, which can damage your health and lead you down a road to hell and misery. It will restrict your opportunities, prevent you from seeing better alternatives, limit you and keep you stuck in the survival state of existing. Everytime you think a positive thought. It will empower you enormously, your energy will shift to your natural feel good energy state. Your body will begin to relax and your restless mind, will begin to still. Your mindset will shift to one of hope and optimism and in time your health and well-being will begin to improve. Accepting the worse and accepting what is. Is one way to cease negative emotions. Making a habit to think the and expect the best case scenario can further improve things for you. Each thought you think has an active energy attached to it. "Things are getting better for me, all is well, everything is going to be alright, life is good, I love and approve of myself, I feel fantastic, I have so much to look forwards to, my future looks great, everything is going to workout fine, good things are coming to me"
How does that above sentence, make you feel? Your choice of words and thoughts are the difference between, how you feel, what you do or do not become and achieve, and whether you continue to grow and expand or you stay stuck and small. You do not need to attach any conditions to your positive thinking, just us general types of good feeling thoughts. Your feelings and emotions, will let you know, where you attention and awareness is going. Everything is about feeling good and energy. Make it a habit to either ignore negative thoughts, challenge them or change them. When you put to many conditions on your thinking, you will tend to focus on the lack of what you want or you will have thoughts about what you don't want. When you can be positive and optimistic, when the evidence around your is contracting it, then you will be well on your way to becoming a better you and experiencing a better life. The hardest part, especially as you're beginning to try and get the positive momentum going is, it is very easy to allow your past conditioning or outside influences, to control your train of thoughts. Doesn't it feel great to know, that you have the power to determine how you feel, what you do, and what you become? You have not got to spend all your day thinking positive, but it is important to avoid giving all your attention to negative thought patterns. It is important to understand that, you cannot stop your negative thoughts, but you can stop them from controlling you. There is a better world for you and a far better of feeling, that can only be accessed, when you beat your negative thinking trap and you let go of or you change your negative emotional patterns. Being mindful, of the negative thoughts that make you feel bad, is a good place to start. Either take no notice of them, dismiss them, override them or change them to more supportive and soothing thoughts and self statements is the key. You can fill your mind with a newfound optimism and you can flood your body with those good feeling emotions and endorphins. By, consciously deciding to change your beliefs and your thought processes, and when you do this and practice this repeatedly, you will free yourself from your self limitations. What you will find is, when you eliminate your negative thinking, you and your life will begin to transform and change for the better in so many pleasing and beneficial ways. Many people are at conflict with themselves and their mind and body. Often, people will worry about worrying and negative thinking. Then they assume that there must be something wrong with them or they're are a born worrier. Yes, if your parents were negative, then you can pick up on their negative energy ad beliefs and this can set the benchmark for your beliefs, feelings and perceptions. But, you have the choice to change things. If you have developed a tendency to think negative. Then, try to avoid beating yourself up over it. Of course. It can leave you feeling very annoyed, helpless and frustrated, when you feel as if you cannot break free from your negative thinking and emotional patterns. We all know, that if you want to be more successful, healthier and happier, you need a positive mindset, a positive and persistent mental attitude and a shift in your belief systems. But, it can become very tiring and exhausting, having to constantly put up with relentless bombardment of negative thoughts that are going over and over in your mind, from the moment you wake up, until the moment you fall asleep. The trouble with negative thinking is. Even, when you do manage to fall asleep. Because your mind and body are stuck in a negative and stressful state. This causes you to have a restless night's sleep, leaving you waking up in a negative state of being, and the whole process gets carried forwards into the new day ahead. This is no way to feel exist or for anyone to live their life. What many people do not realize is. Negative thinking and negative emotional patterns and responses, have been hardwired into our brains. Many of your negative thoughts and beliefs are not the thoughts of your own choosing. When you were a young child, you did not just decide one day that you were going to think negative. Most of your early negative conditioning was passed on to you by your family, friends, colleagues, people of authority and your societal conditioning. The rest, is what you have inherited from your negative experiences, your, learned behaviors and your overactive imagination. When you were very young and unaware. You had no idea, that there were better options and choices available to you, you just accepted everything that you were told, as being true. You probably neither had an idea, that you have unlimited potential and abilities. You were to young, to question other people's ideas, beliefs, suggestions and opinion, so you just absorbed the information and accepted. There was no way you could, reject or challenge your conditioning, or tell yourself that you're not going to believe it. If you're lucky enough to grow up in a positive, happy and wealthy environment. Then you might escape this way of thinking, and you will have a better start in life. But, unfortunately most people do not fall into that category. We have evolved to think negative or to think the worse case scenario first, because it helps to protect us and keep us alert and guarded, so we can avoid pitfalls and potential danger. From an evolutionary point of view. In order for man/woman to be able to survive, thrive and continue. We needed, a safety and defence mechanism, that would help to protect us and keep us safe, in a once very hostile and dangerous environment. This is the reason why. You might tend to always think the worse case scenario first. All your negative thought processes and emotional response patterns, have been hardwired into your brain and body system. A little bit of negative can help to motivate you and keep you guarded and it can help you plan for a better and more positive alternative. So long as you are using it to help you solve problems, cover all eventualities so you can plan for things going well. You should only use your negativity to help you to to look for or focus on the positive alternative or to assist you grow and expand, learn from your mistakes or help you search for the answers you are seeking. But, apart from that. Negative thinking is a complete waste of time and energy, that will bring you down and lead you to a life of self sabotage and self limitations. If you often think negative thoughts, then it is not all your own fault. Negative thinking and your fight, flight, freeze response is part of your evolutionary programming and your negative neural emotional associations which have been hardwired into your brain. You cannot remove this safety mechanism and early warning protection mechanism from your genetic makeup. Once, these negative neural pathways and bad feeling responses become hardwired into your brain, then the will keep on repeating the unpleasant negative emotional responses and train of thoughts. The way to begin to change your negative emotional patterns is by changing the negative beliefs and by changing the negative neural associations and pattern recognitions. Which will allow you to calm your mind and body, release negative resistance, rewire your brain, restore your bodies natural free flowing energy state, so you enjoy more of those sweet feeling feel good states. So that you can become the most confident, fulfilled, content, peaceful, healthy and successful version of yourself. Then there is a proven and highly effective technique, called Emotional Freedom Technique that will help you to remove bad memories, limitations, negative emotional patterns. As well as helping you reduce stress and anxiety and eliminate anger and low feeling moods. If you're interested in transforming your life, by removing your negative emotional patterns and rewiring your primitive brain so you can begin to experience emotional freedom, more happiness, inner calm, balance and peace. Then Emotional Freedom Techniques is a tool that can help you to achieve this. Much of our negative thinking, is down to our early childhood programming and experiences. Negative thinking, is also often a by-product of feelings of insecurity and a inner belief of feeling unworthy and not good enough or if you feel your emotional needs are not being met. The only person that can really bring you down, diminish you and cause you to take the negative path of self sabotage, self destruction and self limitations, is yourself. When you accept your weaknesses and your perceived flaws, then nobody can bring you down anymore. It is highly important that you start to build yourself up, instead of bringing yourself down. You are full of unlimited potential, your talents and what you can achieve are limitless. The way to release your insecurities is to learn how to accept yourself and to start to like yourself. Forget about or let go of the things that you cannot change, and only give your attention to, bettering, all the things that you can control or change. Get into the habit of only looking for the good in you and your life. Our thoughts are also affected by our physical state of being. When your body is stressed or your muscles are tense. Then you're more likely to have more tense, thoughts of insecurity and anxious types of thoughts. Negative thoughts and feelings lead to more of the same and they will hold you stuck in the negative feeling range of emotions, as listed below. As a general rule, we think with our emotions, and your emotions can be affected by your physical, state, this means, to free yourself of your negative thoughts, you need to change your perceptions and change your feelings. Because, when your body and physiology is out of balance, then this can cause all sorts of issues and bad feelings in the body, including our emotions and our thought processes. Food can be used as medicine, the body needs plenty of nutrition and good fats, as well as relaxation techniques, all of which can bring your mind and body back into balance. What most people don't realize is, that negative thinking and negative emotional patterns can become hardwired into your brain. Once these negative thought patterns, associations and limiting beliefs have been programmed and etched into your brain, they can have a massive impact and influence on, you you think, act and behave. Sometimes there is more to our problems than we might have thought, and to fix the problem you have to delve into and put right the root cause. Changing your thinking to be more positive, or at least, not negative along with changing your feelings and emotions, is the best approach to end your negative thinking. Negative thinking is any train of thoughts that make you feel bad, anxious or miserable, negative thoughts cause resistance to who you really are because they disrupt the free flowing good feeling energy state of being that you should be experiencing. Negativity can diminish you and rob you of your true powers, but you can also flip things around and use it to motivate you and make you better. Make it your intention that you will triumph and make you and what you're doing great. It is so easy to let what is or what has happened to drag you down, with each emotional state comes a different story and a different outcome in your life. When things go wrong, it can be so easy to fall into the self destructive trap of negativity, but you are much more powerful and stronger than your negative self. Negativity will take you away from your goals and who you really are. So be mindful of your thoughts and the stories that you're telling yourself, and if you notice yourself telling you a negative story, close the chapter on negativity, and start a brand new and more positive chapter of your life. When negativity strikes, take command of your mind and the stories you tell yourself and steer your life ln the positive direction that you want to go. Thoughts are free, the right thoughts will empower you and make you feel good, the wrong ones will diminish you and bring you down. The truth is, the only person that can bring you down is yourself. Nothing, and I mean nothing can stop you thinking positive and empowering life changing thoughts, which will not only make you feel better, but can also lead you to positive and inspired actions and positive results and outcomes. Our thoughts are information, positive or neutral thoughts can upgrade you, your life and your body and negative thoughts can downgrade your body, you and your life. It is not the thoughts that are the real problem, thoughts are just thoughts, the real issue is how much emotion, meaning and significance you attach the thoughts, problem or situation. Most people just do not know how to deal with their negative and unwanted thoughts, they spend more time trying to resist or defeat their thoughts and imaginings. However, this approach never works, because the more you try and stop thinking about something the more emotion and significance your mind will give to the thoughts, and your mind will keep on returning back to them. Think of your mind as a pool of water, when you're feeling calm and at peace, then the surface of your mind will be still. But when you are thinking negative thoughts that offer resistance, then the surface of your mind will become choppy and turbulent. Trying to stop thinking about certain thoughts or situations, will cause bigger and bigger ripples on the surface of your mind. The trick is, you have to become mindful and aware of all the types of thoughts that are making you feel bad and limiting your success. Most people spend all their day fighting with their thoughts and feelings, but when you try to suppress, fight or resist your thoughts and feelings, they will defeat you every time and leave you constantly feeling frustrated and exhausted. Negative thoughts can make your life a misery, they can spoil your sleep and dictate what you do in your life. If that wasn't bad enough, you also need to be aware of the fact, that your thoughts can dictate and determine your future. But it is not just the thoughts that are the problem, because everytime you think negative, then you will create negative what if and the worst case scenarios in your imagination. Your nervous system cannot distinguish between what is real and what is imagined, therefore your body will react with fear, stress, anger or sadness, depending on what type of negative thoughts you are thinking. But, if you do the opposite to what you have been doing, which means, you accept your negative thoughts and the feelings that are accompanied by them, and you stay calm around your negative thoughts, then your mind will settle down by itself. Just acknowledge them as just thoughts making sure you, offer no resistance what so ever, which means no more being sensitive to your thoughts. Although you should accept your thoughts and let then pass on bye peacefully, this does not mean that you have to accept them as being true. It is best to just, let your mind think the negative thoughts, you are only reacting with fear and stress because, your mind thinks the thoughts and imaginings are a threat that needs avoiding or defeating. You will be greeted by a small amount of emotional arousal, but if you get out of the way, then the surface of your mind will still and calm itself. Once you have accepted your negative thoughts, and allowed your mind to think them for a while, then you can decide what action you wish to choose, if any. You can just release the thoughts and let them go. This means a tiny bit of discomfort, but no more days and weeks of stress, worry and anxiety. This takes a bit of practice, but just make sure that you do not react or become emotionally engaged with your negative thoughts and feelings. Sometimes your negative thoughts can become deeply engraved in our subconscious mind. You may have had a bad memory or experience, or you might have some limiting beliefs or negative associations which are driving your negative thought processes. If you are being plagued by the same old repetitive negative thought patterns, then you may need to some extra emotional work and clearing. Life can throw up a lot of adversity and problems, all of which we observe, take on board and consequently will allow them to affect how we think and feel. Although you cannot always control everything that happens in your environment and the world, you can control how you wish to react. You are the creator of your own life's experience, and how you think and feel well play a huge factor in what you do and become. "What comes first the chicken or the egg," could also apply to a large degree to your life. "What comes first the feelings or the things that you experience and manifest in your life." The answer is, your feelings come before the things that you create or the things that happen to you, what this means is, you have to change your feelings before you can experience and access all the good things that you want. What this means is, what you feel you attract a matching experience into your life. If your dominant feelings and thoughts are negative, negative things will come into your life experience or you will miss out on all the opportunities and good that life has to offer. If you allow what you see, hear and experience, to affect how you think and feel, then you will continue to stay stuck in a state and place of negativity. If you want to escape from the monotony of negative thinking and feeling then you will need to change your feelings and change your focus of attention off from what you have been seeing, hearing and experiencing. Because before you can begin to change your experiences and change your life for the better, you first have to change how you think and feel on the inside. Negative thinking arises when you give your attention to what you don't want or what you would like but you have not got. Many people won't take control of their lives and feelings because they don't want to take responsibility for their situations and what is coming to them. Most people would prefer to blame everybody and everything for the situation that they are currently in, making them the victim of their circumstances rather than admitting it is partly their fault. Again, this does not mean that you are to blame for everything that happens to you or others, but you do have full control over what type of life you want to live and experience. Although you're not to blame for all the bad stuff that is happening around you, it does give you the power to create a better life for yourself, and you can do a lot to prevent bad things happening to you. It can be hard to admit and accept that the reason why you feel and think negatively, and the reason why things keep going wrong for you, are a result of your previous negative thinking and feeling. But even though you did not choose to be in the situation that you're currently in, because you did not mean it to be this way, how you have been thinking and feeling previously, and of late, will affect where you currently are. But now you know that you have control of how you feel and your life circumstances and outcomes, the power is handed back to you, all you need to do, is get the positive momentum going and keep it rolling. This will require a bit of practice and focus, but with a bit of conscious effort you will soon start switching from a bad feeling and bad experiencing place to a place of balance and a better life of your own making. The best time to get that positive or calm feeling momentum going is first thing in the morning. As soon as you wake up, and before all your old baggage, or negative ways of thinking have a chance to surface. Start to be grateful and appreciative, focus as if everything is great and think and act as if all is well. Then try to keep the good feeling momentum going all day, this does not mean you have to think positive all day long, just be mindful of any negative thoughts and either let them go or replace them. Try and deal with the root source of your negative thinking, say you're in a bad situation or a situation where you convince yourself you don't want to be in, such as a relationship or job. What you can do is, one of two things, if the situation is really bad then getting out of it. However, you don't have to change your relationship or your job, all you have to do is change your attitude to one of accepting where you don't want to be and even better still, you can actually make a big shift in your attitude and want you go on to achieve. Once you do that, you will also start to shift your state from negative to positive and peaceful. Access and evaluate the situation, whatever it is that has been bothering you ask yourself how is it going to help you thinking about it and what' the actual point in thinking this way. If thoughts are not helping or making you feel bad, then tell yourself you wish to dismiss the thoughts as they are no benefit to me. One tip you can try to alleviate the negative emotion is to picture your thoughts on a TV. While observing your thoughts and the images in your mind on the imaginary TV visualize yourself turning a dial that controls the sound your thoughts down. Every time you make a statement, whether it is positive or negative your subconscious mind will take it as being true and it will proceed to do everything in its creative power to bring about those circumstances for you, your thoughts are the sowing the seeds for your future. "All is well, and my future looks great". Start each day off with " Today is going to be the best day of my life"
If you have been having a bad time of late, then trying to jump from a negative place to a happy feel good place may take time. Sometimes you have to progressively move up through the emotional scale, because trying to forcefully think positive when you have been feeling negative may be a bit too hard or too big of a leap. The first thing that you should do is to express your emotions, go and watch or listen to something sad and have a good cry to release the emotion. Then, once you have let it all out, start to focus on and plan for a better future, begin to focus on what you want instead of what you don't want or don't have. Again, each morning and when you are about to go to sleep, be thankful, and start to tell yourself some positive words and phrases about you and your life. These positive words and phrases do not have to be specific or a condition of anything, just use general words and thoughts that have no conditions attached to them. You have not got to spend the whole day trying to think positive, just spend a few minutes, first thing in the morning and last thing at nights, and a few times throughout your day. The thing to do is to act as if everything is OK and all is well, despite how you're feeling or despite your current situation. Most people live their life stuck in the negative emotions of what is or what has happened, and they spend all their time and energy trying to fight with what is. The way to change what is, is to stop reacting to it negatively, accept it, then focus on being as if everything is just fine. This is where you use general positive thoughts and words, that will make you feel better, because your first priority should be to feel good, and despite what you think, you do not need a reason to feel good, all you need is to stop resisting things and just use general feel good words and thoughts. Or you can make a short story about how good you're starting to feel now and how good your life is going to be. Although it is good to have goals and desires, you actually need very little to feel good, the key is practice the art of feeling good, because once you get that feel good momentum going then you want to maintain those good feeling emotions. Being aware, mindful and consistent is the key, and the more better and relaxed you feel, then what you will find is, more good opportunities, idea's and good things will come your way. If you want to move forwards then you have to let go of what is, so you can separate your negative past from your now and your positive future. This should involve, less focusing and reacting to what is happening in your reality and then focusing more on feeling good on the inside. Because it does not matter about what is, or how you're currently feeling, as long as you know that you have the ability to start to change how you feel and your life at any given moment. When you worry or think negative, you will be causing a resistance to your natural feel good and balanced state. So, ideally, although you cannot go through life without any resistance or challenges, you want to try and take the path of the least resistance. If you notice you're focusing on things that are making you feel bad, then you want to try not to go there, let the thoughts come through you and away then try and reassure your mind that everything will be OK.
You only want to remember and think about your happy experiences, with the attitude of, what has happened as gone, and so you're going to enjoy what is now. Or you may have been so emotionally involved in your problems that you did not realize you were in complete control over how you feel and where your life is heading, but now you know different the ball is firmly in your court. Make it a habit to exercise or keep active, learn from your mistakes and failures and keep moving forwards, because unless you take chances and you are prepared to make mistakes, you cannot grow and become better. Try and reduce and release any tension, having a nice poised, balanced and tension free posture will make you feel better. Adversity is not always the end of the world, learn from the past because it is a chance to evaluate your situation and come back stronger and better. Mistakes and failures or not a weakness, giving up is a weakness. Our diet can affect how we feel, everybody is genetically different, so you might need to experiment to find out which foods make you feel good and which foods make you feel bad. It is important to eat foods that are high in nutrients. According to "Dr Mark Hyman", on the contrary to what we have been told, the body needs a certain amount of fats. (Not the trans fats). Fats, plays an important part in good brain and body functioning, and a well balanced and varied diet should include fats, especially the good fats that are rich in omega three. As a general rule, although you cannot eliminate all saturated fats that contain omega-6, like vegetable oils, which are believed to cause inflammation in the body. Consuming too much omega-6 fats and under-consuming omega-3 fats can affect your mood and cause many other problems in the body. Fatty acids that are rich in omega three, help to reduce inflammation and promote good brain and body functioning. Learning to relax and getting enough good quality, restful sleep will also help you to improve your mood. Learn to listen to your body, because if you feel tired or exhausted, then this is an indication that you need to rest and take it easy. If you are experiencing health related or emotional issues, then this could indicate that you need to make some healthy lifestyle or diet changes. (Always consult with your Doctor first).